Whether you’re looking for full-time income or part-time work, you might want to consider jobs that offer the chance to earn tips. Yes, it’s true that the minimum wage for tipped positions is $2.13 per hour in more than 20 states. It’s also true that a waiter got a $10,000 tip from Donald Trump. But more relevant than your local minimum wage or the many amazing tipping stories is the fact that you can consistently make good money from tips. I first received tips as a pizza delivery driver in a small town in northern Michigan in 1985. I averaged $8.60 per hour with regular wages and tips, and a government inflation calculator tells me that’s the equivalent of making $19.07 per hour today — not bad for a part-time job that doesn’t take much experience. Full disclosure: A friend delivering pizzas in that same town says he made only about $14 per hour in 2013. When I dealt blackjack at a small casino in Michigan in the 1990s, I had nights where earned hundreds of dollars in tips. I made about $14 per hour between my base rate and tips, equal to $23 per hour today, which is about what my friends still there say they’re making. One of them recently quit a $19-per-hour management position and returned to dealing blackjack because the pay was better, thanks to tips. However, the average wage for waiters and waitresses is just $8.63 per hour, according to the Bureau of Labor Statistics. Clearly, not all tipped jobs are lucrative. So how do you choose the right job and earn the most tips? Naturally, you’ll enjoy and be more qualified for some jobs over others. Use these preferences to help narrow down that list. Then, look for the positions where you’ll make the most money. An obvious example: If cleaning hotel rooms and waiting tables are both still on your list, go for the restaurant job. Exotic dancers earn the most tips — $25.40 per hour (not counting any base wage), according to study done by PayScale.com. But you might prefer one of the other jobs on their list, such as gaming dealer ($12.80 per hour in tips) or sommelier ($10.10 per hour in tips). Of course those are only averages, and only for tips. To earn the most money, seek out employment where tips and base wages are above average. Many employers pay a base rate of minimum wage. If you’re interested in moving, you could go to a state that has a higher minimum wage for tipped employees. For example, the minimum wage in Idaho is just $3.35 per hour, while next door in Washington or Oregon it’s more $9 per hour, according to the U.S. Department of Labor. Of course, even in a state with a $2.13 minimum wage, some employers will pay a higher base rate. Ask about the pay before applying. Tips are usually what matter most, but making an extra $5 or $6 per hour on your base rate can help a lot. One of the most important factors affecting tips, especially in the food and beverage industry, is the size of the average bill. Customers tip according to the bill amount more than anything else. The average tip in U.S. restaurants is now 19%, according to a recent Zagat survey. So, as a waiter, if you serve a dozen $40 tables in an evening, you’ll average about $91 in tips, but if the bills are $90, you’ll take in more than $200. This is true for other tipped positions as well. Ask any bartender who has worked in both a dive bar and a high-end pub. Work for pricey places when possible. Even a restaurant with expensive meals might not be a great place to work if you wait on just three tables per shift. Serving twice as many customers usually means you earn twice as much in tips. Look for busy businesses. Once you decide what kind of job you want, pick which state you’ll work in, and identify some expensive, busy places, it’s time to investigate specific employers. Start by asking about the base rate, as mentioned. 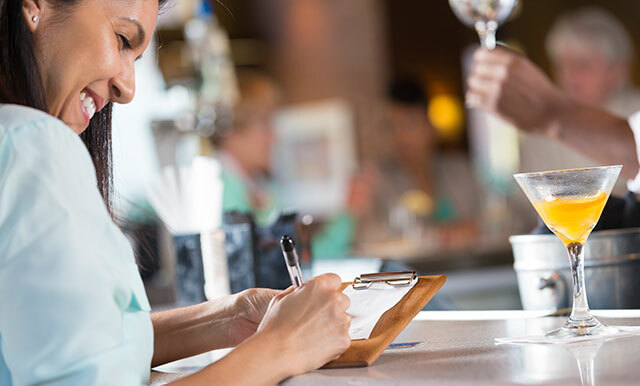 Tip income varies widely by employer, even those with similar businesses and price levels. One employer might let you keep all of your tips, while another makes employees share them. For example, I once worked at a pizza place where it was policy to split large tips (over $5) with all employees. And it’s common for wait staff to “tip out” busboys and hosts with 10% or more of what they take in. For large employers, you can often find the relevant pay information on Glassdoor.com. Otherwise, get friendly with employees of prospective employers so you can ask about their wages. Also check with your friends and family members who happen to work as waiters, casino dealers, bartenders and so on. Ask how tips are handled and how much they usually amount to. Listen carefully to employees, but don’t place much importance on stories about one-time tips or memorable shifts. In fact, ask about the worst days. You might get lucky and discover a job where the worst tip days are still pretty good. You want an average, and most employees don’t bother to calculate that accurately. But if you ask for examples from ordinary shifts and bad shifts, you can put together a relatively safe guestimate of the tips you’ll make at a given job. Then you can calculate what you’ll make with the base rate included. What if You Lack Experience? If you lack experience, you won’t qualify for the best positions and may not get hired at the best places. In that case use a longer-term strategy. For example, caddy at a slow golf course as a resume builder so you can get hired at a better place. Use a position as a busboy as a temporary stop on the way to being promoted to waiting tables. Take a job in a restaurant kitchen only if your employer says you can join the wait staff as soon as you prove yourself. There are always opportunities to build your resume or places where you can quickly advance. For example, many bars won’t hire an inexperienced bartender, but will hire you as a bar-back. It’s “like being an intern,” explained bar-back Brendan O’Connor in an article on The Billfold, and involves washing glasses, cleaning up, refilling supplies and sometimes serving drinks. Making $140 in tips for a shift is pretty good, and after you put in some time as a bar-back you might be promoted to bartender or server. Once you have a job where you make good tips, you can move on to part two of your plan: Implementing strategies for making even more tips. Your Turn: Have you ever had a job where you got tips? How much did you make, and would you like a follow-up post about scientifically proven ways to make more tips?